I think anyone, from any background, be it collecting, historical preservation, or otherwise, can appreciate that level of scientific study and effort that you all have put forth. It'd be amazing if our two communities could come together and aid in solving or, at the very least, bringing the case one step closer to its conclusion. This is, undoubtedly, one of the greatest American mysteries of all time. To be honest, I had not read into her final flight(s) of the circumnavigation attempt in some time and did not realize she had made so many stops. There sure is quite a large amount of ground to cover there but, surprisingly, Mobiloil had taken ground in just about every single one of those countries/regions/continents at one time or another. Add that to the fact that, as any large corporation, their political/financial/legal pull was not really subject to borders. 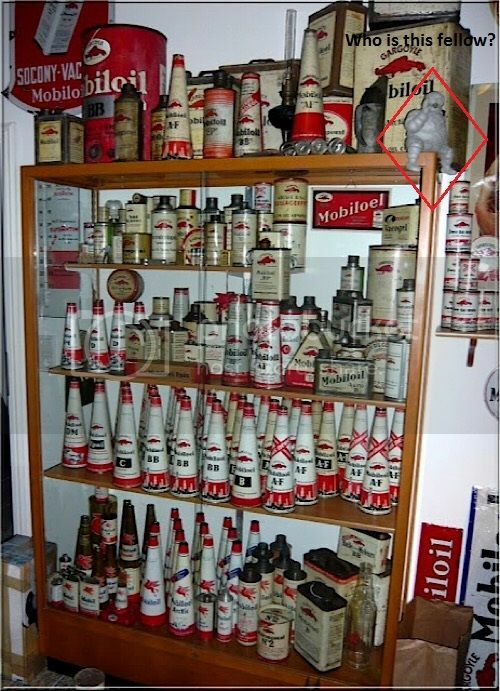 While I do admit that there were attempts to capitalize on the likeness of the "Gargoyle" abroad, the cans appearing in the picture are far too similar to Mobiloil products to be knock-offs. I will attach a picture of such cans that gave a go at appearing similar to the Gargoyle, while not appearing similar enough to be sued... at least not to my knowledge. I am sure most here have heard the stories of the Independent Oil Co. being brought to court by Standard Oil of Indiana and successfully (at least for all but the obscurest items) in removing the "Red Hat" from their products. Their claim being it similarly resembled the "Red Crown" logo - laughably. I will absolutely keep looking through any information I have at my disposal - all it takes is for one of these cans to pop up somewhere on the internet, be it here or abroad, for this question to be answered. Many folk here have spent decades trying to find a can/sign/globe of their dreams, so patience is something, I believe, we are all used to. Last edited by RedHat; Mon May 08 2017 04:16 PM. Thank you RedHat, with fellows like you searching it might not be long before something turns up. It may be Amelia was given a product some 6 -7 years old along the way,...I think the shelf life would probably be ok, ..it might be good to use today in fact, I don't think grease breaks down too much in a closed container. It is interesting that following the accident at Luke field in Hawaii during her first attempt, that an inventory was done of the contents of the wrecked Electra, and as far as oil/grease products, two were mentioned, they being (1) 5lb can Mobile grease NO 2, (1) 10lb can Mobil grease number NO 2, and (1) 5lb can of Lubriplate. An accompanying article related that she carried a special grease aboard, to lube her propeller hubs. I don't think the NO 2 Mobile grease would fall into the special category, but how about the lubriplate,...and would Mobilubricant be an equivalent to Lubriplate? It seems she picked up another item that was different from the list, ...whatever is in the Gargoyle can next to Fred Noonan. Have you determined what that container's label might read? Last edited by Jerry Germann; Mon May 08 2017 11:05 PM. Come to think of it, Pang Oil may actually be affiliated to Mobiloil in some way, be it a subsidiary or something else. I lose a bit during translating here and there, but the more I read the more it makes sense. Not really important in this conversation, but a side note nonetheless. To answer your question about old oils and greases, I have heard of people who do not like their quart cans being full (either too much weight on a shelf, heavier cans falling cause more damage, or issues with home insurance) actually using that oil in their old cars. Some of those oils were almost 100 years old! While I do not recommend it, nor would I use it in my own car, it is feasible. With that line of thought, 6-7 years is nothing. Back then, I can't say there would be any second thoughts about doing this. Grease would more or less follow the same train of thought. As for the two cans, I am still looking around and contacting a few collectors who have insight to cans we do not have here in the states. The can behind Noonan, for whatever reason, rings a bell. I feel like I have seen a photo of one rather recently, but have yet to come across it again. If you can, I would contact the individual from the thread you came across through a PM and see if they still have the photo or info. Now Lubriplate is a brand I have very little knowledge on. I cannot say it is a brand that has a huge following, albeit for a few cans here and there, so info may be few and far between, but I would be guessing. I would say it is comparable to a Mobilubricant in the way that any all-purpose lubricant is comparable to another. I cannot say I have too much insight into any "special" grease for propellers, but I see no reason that Lubriplate would fall into such a category. Today, if Lubriplate were a car, it would be a Camry...just really basic. Thanks again RedHat,....here is that link to the old post concerning discussion about old mobilubricant cans....I can't open the images to see if the cans are round or square like we need. Tough one to find. I find several round 5lb tins with the Mobilubricant wording on the can, but no square ones thus far. note the incorporated in Australia print.....and only one side of the tin has a pegasus, is it possible that the tin we see Earhart holding is marked the same as this ebay can? Are we seeing the back of the can when we see only the product identified inside ( minus any Pegasus or Gargoyle on that side? Last edited by Jerry Germann; Mon May 15 2017 10:24 PM. Still looking for more information, images, dimensions etc, concerning the Mobilubricant can discussed in this thread. Hello again, thanks to all who have helped in this quest thus far. If anyone has or comes across a can exactly like this, please let me know. Bump, Bump stumped,..can't find one like it. Bump again ...hope someone can help out with this. Rats no luck finding a can exactly like the one I need. Maybe something identical will turn up one of these days.